here is one that seems pretty practical. or maybe more if it was mounted to the wall. Wirenuts, that 'bottle' contains a euro-style receptacle, and is filled with expanding foam. 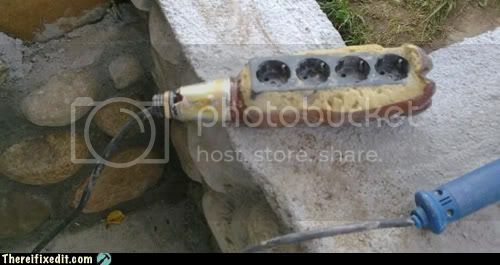 It's rather similar to what Joe T had in his infamous 'soap bottle' extension cord - only this one has space for several cords to plug in. 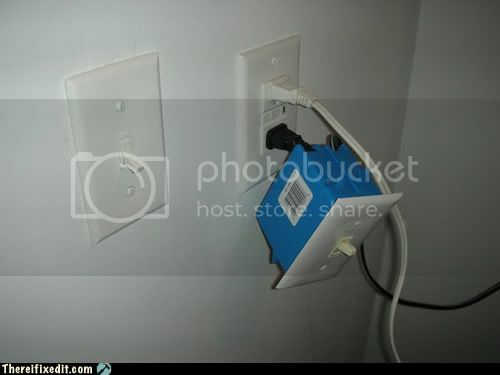 As for the receptacle and switch in the last picture being at different heights, there might be a fire-block in the wall, preventing a cut-in box from being set higher. Many pre-1960 homes had fireblocks offset at about the 4ft. height. Unfortunately I think Pic 1 and two aren't anywhere as bad as they look. #1 one looks suspiciously like a regular power strip just covered with a bottle to make it look cooler (well, maybe the bottom of the strip was broken), it's definitely not a regular wall outlet. 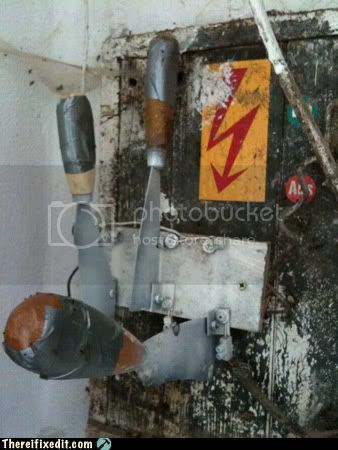 The second one is likely German (see the German On/Off stickers) and I assume that switch isn't live, just some kind of decoration or art object. Open knife switches have't been used around here since the early 1930s and then only in electrical rooms of power plants and similar locations only accessible to trained personnel. The third one is a different beast though... but certainly not the worst I've seen. The second one is likely German (see the German On/Off stickers) and I assume that switch isn't live, just some kind of decoration or art object. And since when do putty knives with duct-tape on them qualify as switch mechanisms? since when do they qualify as decoration aswell??? To me, this looks like something EE students might come up with to spiff up a "studying room" or something like that. Or maybe ( I know this happened somewhere near Vienna) an old power plant has been converted to a dance/concert hall and this was someone's creative idea of reusing parts of the old switchgear for what people who don't know anything about electricity might consider an "authentic look" but with a funny twist. I read the comments on the power strip and now have four possible explanations: a) the strip is intact and has only been encapsulated for the fun of it. c) the strip was broken and "repaired"
d) the strip was intact and encapsulated to float on water... the scariest possibility. Both might just be jokes, remember the electric BBQ in the swimming pool with the power strip floating on a shoe! The pictures were actually staged in the aftermath of a LAN gaming party and the whole shebang wasn't connected to anything. Still, knowing some of the things people (especially first generation immigrants from some of our neighboring countries, but Germans and Austrians too) can do, the first one could be real. Those look like circus throwing-knives, parked up for the winter. Earl 'Blind as a Bat' Zappatta and his Assistant, Olga the 23rd, used a set just like it. I can't tell if that is really pitting, or simply that they were closed when the assembly was dusted with white spray paint..